This photo was taken on 9th November 2008 in Petaling Jaya Police District headquarters showing me after assaulted by police shortly after the incident. Me posing with Father Paulino Miranda, a priest who was charged for participating in an illegal assembly on 9th November 2008. PETALING JAYA, Sept 18 — Twenty-one people, including several opposition lawmakers and a Catholic priest, were acquitted by a Sessions Court today for taking part in a Bersih anniversary candlelight vigil held four years ago. Sessions Court judge Hayatul Akmal ruled this morning that the prosecution had failed to prove a prima facie case against the individuals, who were earlier charged with participating in an “illegal assembly” under the now-repealed section 27 of the Police Act. Speaking to reporters outside the courtroom here, lawyer and DAP MP Gobind Singh Deo urged the prosecution not to appeal the matter to a higher court. “The prosecution clearly did not have strong evidence to prove that the organisers had committed any wrong. Therefore, I hope the Attorney-General’s Chambers will not appeal the matter. “This is a great victory for us, particularly since this case has been going on for almost three years now,” said the Puchong MP. The 21, including Catholic priest Rev Father Paulino Miranda, Petaling Jaya Utara MP Tony Pua, Selangor DAP state assemblymen Ronnie Liu (picture) and Lau Weng San, and Petaling Jaya city councillor Tiew Way Keng, were charged with taking part in an illegal assembly in front of the Petaling Jaya City Council (MBPJ) building on October 9, 2008 between 9pm and 10.10pm. They were accused of refusing a police order to disperse under section 27(5)(a) and section 27(4) of the Police Act 1967 which has since been amended and replaced with a new law allowing for peaceful public rallies. All the 21 accused, whose ages ranged between 25 and 62, had earlier pleaded not guilty to the charges, which carry a maximum fine of up to RM10,000, and a maximum one-year jail term. “In the first place, this is not even an offence. So I hope the AGC (Attorney-General’s Chambers) will accept the court’s decision and not appeal,” DAP adviser Lim Kit Siang told reporters today. Pua, who is also the DAP’s publicity secretary, agreed, saying the vigil participants should not have even been detained as the event had not been violent. “We merely gathered, sang ‘Negaraku’, and burned a candle to commemorate the occasion. We did not use violence. “The Malaysian government should respect every individual’s constitutional right to freedom of assembly,” he said. In June, Miranda, who is the parish priest of the Catholic church in Shah Alam, told The Malaysian Insider that he would rather go to jail than spend a single sen on a fine for his participation in the vigil. “Paying the fine would be conceding that what I did was wrong,” he had said. The vocal priest had also asked his lawyer, Francis Pereira, to write in to the Attorney-General’s Chambers in September last year asking for the charges against him to be dropped following the change in law. It was to no avail. The public prosecutor wrote back three months later, in November 2011, rejecting his application. “I’ve decided, simply because as far as I am concerned, I did not do anything wrong. “The whole thing was a candlelight vigil calling for the abolishment of the ISA,” Miranda said, referring to the recently repealed Internal Security Act, which had been criticised as an outdated law used to clamp down on dissent against the ruling Barisan Nasional (BN) government. The case has been linked to the two Bersih rallies on July 9 last year and the more recent April 28 assembly in Dataran Merdeka, putting the spotlight on the government’s use of laws to clamp down on dissent, despite having repealed the controversial ISA. ELDERLY ladies in the Sungei Way new village in Petaling Jaya are being targeted by conmen who take advantage of their vulnerability. Ooi Lea Choo, 63, said that she received a call about a week ago from a man who claimed that her 38-year-old son had been kidnapped and beaten up. “The call came at about 1pm. The man spoke in Cantonese and asked for RM30,000. I could hear screaming over the phone and I immediately panicked because I really thought that they had beaten my son,” said Ooi. Fortunately for her, she immediately called her son and found that he was in fact safe and unharmed. 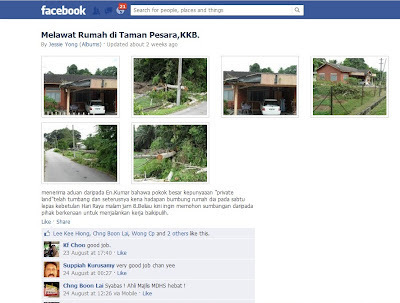 Kampung Tunku assemblyman Lau Weng San said that at least five ladies living along the same road in Sungei Way had received the same call. “We suspect that the man making the calls know these ladies well because he knew a lot about their family background. I tried calling back the number and a lady answered the phone saying she had no idea what I was talking about,” said Lau. Another resident, who only wanted to be known as Mrs Chong, 69, said that she received a similar call telling her that her 38-year-old son working in Singapore had been kidnapped by Ah Longs (money lenders) and was beaten up. “They also asked me for RM30,000. My husband was not around at that time and I was just distraught. I told them that I would meet them at the cinema to hand them the money but they immediately knew that the cinema was in front of the police station. “Thankfully, one of my neighbours helped me call my daughter. She immediately contacted my son in Singapore and he was actually sleeping at home,” she said. Lau said that these cheating cases was quite rampant in Sungei Way. “Some people would offer residents goods at discounted prices provided that they commit a certain amount of deposit. One lady was cheated off her life savings of about RM70,000. “I urge those who have come in contact with these conmen or were cheated to lodge a police report. Young adults working away from their hometown should communicate regularly with their elderly parents and update them of their whereabouts so that they do not fall prey to these conmen,” he said. Tempat: Dewan MBPJ Sungai Way, SS 9A,Jalan SS9A/1, Sungai Way 46300 Petaling Jaya.